How to View / Download Form 26AS ? What is Form 26AS ? 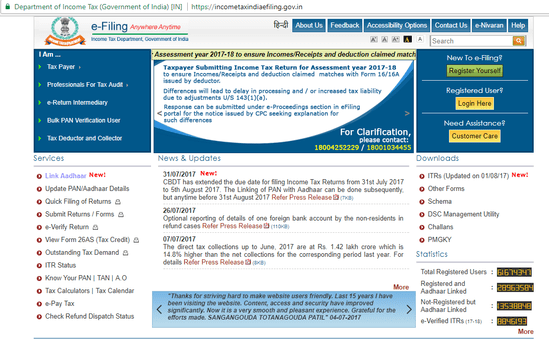 Go to https://incometaxindiaefiling.gov.in and click on login. If you don’t have account, please click on register and create an account. Enter the User Id (Your PAN number), Password, date of birth/incorporation and captcha. Now click on login. After login, the following screen will appear. Go to my account and click on View Form 26AS (Tax Credit) in the drop-down menu. Click on confirm so that you will be re directed to TDS-CPC (Traces) website to view your form 26AS. Now you are on the Traces Website(TDS-CPC). Select the box and proceed. Click on the link View Tax credit (Form 26AS) at the bottom of the page to view form 26AS. Select the Assessment year, format (HTML /pdf/text) in which you want to see your Form 26AS, enter verification code and click on view /download. (i) If you want to see the form 26AS in online, select the format as HTML..
(ii) If you want to download the 26AS, select the format as pdf / text. The password for opening your form 26AS is your date of birth in ddmmyyyy format. A tax payer who has internet banking access with a bank authorised by the Income Tax Department to show tax credit can use this facility. A Tax payer can view his Form 26AS only if his PAN number is mapped to that bank account. Login to internet banking and click on view form 26AS.